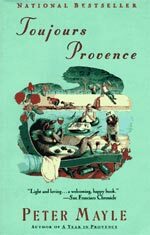 Toujours Provence is the exciting sequel to Peter Mayle's best seller, A Year in Provence. In this second book of three, Mayle continues to recount tales and narratives about his time spent in Provence. Readers of the first book will quickly be returned to memories of a beautifully enchanting region, while newcomers will discover a charming place which countless others have fallen in love with in the past. Mayle's humorous and easy to read style, make Toujours Provence a truly delightful read.